This is a golden opportunity for you to participate as a speaker in this international high-profile event. Other distinguished speakers from academia and leaders of different industries and winners of the Customer Relationship Excellence Awards will also share their success stories and valuable insights to achieve the goal of the market leadership and customer relationship excellence. Register now to enjoy an early-bird discount with 50% off till 30 September 2017. You may follow the guidelines outlined below to make sure your presentation paper is considered. You may showcase your products or services to the participants of the CRE and CSQS Leadership Summit 2018, who are the most senior management executives from leading companies in different industries. 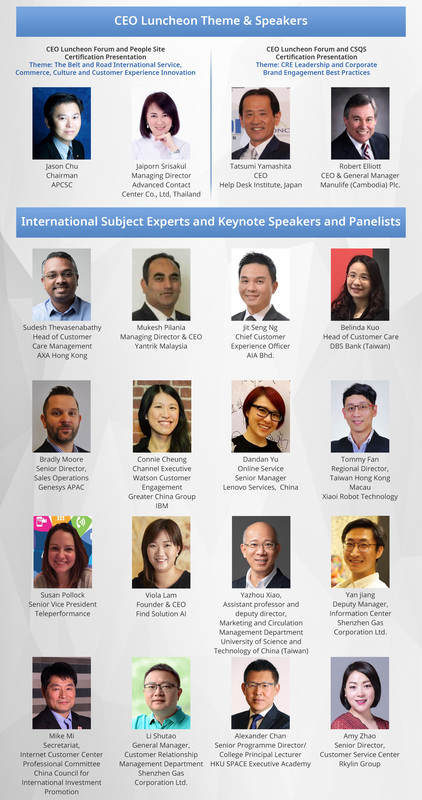 Don't miss this exceptional opportunity to take part in this Leadership Summit in the Asia Pacific Region that is helping to shape the future of the services industry. By securing a sponsorship / exhibition space you will have the opportunity to establish close relationships with your target market and optimally position your brand before, during and after the event. DHL-Sinotrans International Air Courier Ltd. SBS Transit Ltd. Your participation will be rewarded with insights on rebuilding consumers' confidence, building competitive advantages and turning challenges into opportunities in the global financial crisis! Quality Standard (CSQS) Leadership Summit please contact the Summit Secretariat directly. If you registered our CCCM, CCSA or CCSM course, you can get an extra 50% discount on the Summit. Please click here register now!